I’ve submitted a proposal for a SXSW 2012 panel called Data Mining Music. The PanelPicker page for the talk is here: Data Mining Music. If you feel so inclined feel free to comment and/or vote for the talk. I promise to fill the talk with all sorts of fun info that you can extract from datasets like the Million Song Dataset. Data mining is the process of extracting patterns and knowledge from large data sets. It has already helped revolutionized fields as diverse as advertising and medicine. In this talk we dive into mega-scale music data such as the Million Song Dataset (a recently released, freely-available collection of detailed audio features and metadata for a million contemporary popular music tracks) to help us get a better understanding of the music and the artists that perform the music. We explore how we can use music data mining for tasks such as automatic genre detection, song similarity for music recommendation, and data visualization for music exploration and discovery. We use these techniques to try to answers questions about music such as: Which drummers use click tracks to help set the tempo? or Is music really faster and louder than it used to be? Finally, we look at techniques and challenges in processing these extremely large datasets. What large music datasets are available for data mining? What insights about music can we gain from mining acoustic music data? 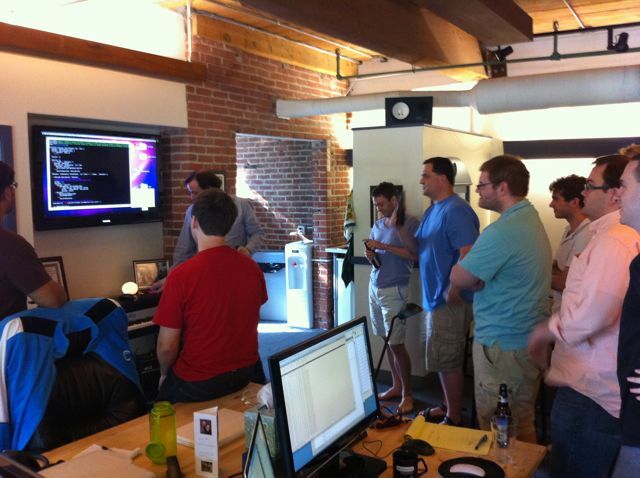 What can we learn from mining music listener behavior data? Who is a better drummer: Buddy Rich or Neil Peart? What are some of the challenges in processing these extremely large datasets? How do you spell ‘Britney Spears’? I’ve been under the weather for the last couple of weeks, which has prevented me from doing most things, including blogging. Luckily, I had a blog post sitting in my drafts folder almost ready to go. I spent a bit of time today finishing it up, and so here it is. A look at the fascinating world of spelling correction for artist names. In today’s digital music world, you will often look for music by typing an artist name into a search box of your favorite music app. However this becomes a problem if you don’t know how to spell the name of the artist you are looking for. This is probably not much of a problem if you are looking for U2, but it most definitely is a problem if you are looking for Röyksopp, Jamiroquai or Britney Spears. To help solve this problem, we can try to identify common misspellings for artists and use these misspellings to help steer you to the artists that you are looking for. A good place for us to start is a post by Peter Norvig (Director of Research at Google) called ‘How to write a spelling corrector‘ which presents a fully operational spelling corrector in 21 lines of Python. (It is a phenomenal bit of code, worth the time studying it). At the core of Peter’s algorithm is the concept of the edit distance which is a way to represent the similarity of two strings by calculating the number of operations (inserts, deletes, replacements and transpositions) needed to transform one string into the other. Peter cites literature that suggests that 80 to 95% of spelling errors are within an edit distance of 1 (meaning that most misspellings are just one insert, delete, replacement or transposition away from the correct word). Not being satisfied with that accuracy, Peter’s algorithm considers all words that are within an edit distance of 2 as candidates for his spelling corrector. For Peter’s small test case (he wrote his system on a plane so he didn’t have lots of data nearby), his corrector covered 98.9% of his test cases. A few years ago, the smart folks at Google posted a list of Britney Spears spelling corrections that shows nearly 600 variants on Ms. Spears name collected in three months of Google searches. Perusing the list, you’ll find all sorts of interesting variations such as ‘birtheny spears’ , ‘brinsley spears’ and ‘britain spears’. 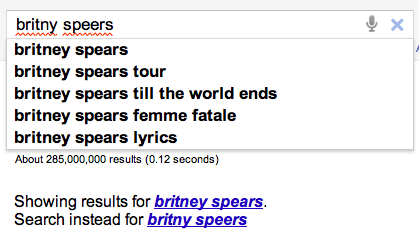 I suspect that some these queries (like ‘Brandi Spears’) may actually not be for the pop artist. One curiosity in the list is that although there are 600 variations on the spelling of ‘Britney’ there is exactly one way that ‘spears’ is spelled. There’s no ‘speers’ or ‘spheres’, or ‘britany’s beers’ on this list. One thing I did notice about Google’s list of Britneys is that there are many variations that seem to be further away from the correct spelling than an edit distance of two at the core of Peter’s algorithm. This means that if you give these variants to Peter’s spelling corrector, it won’t find the proper spelling. Being an empiricist I tried it and found that of the 593 variants of ‘Britney Spears’, 200 were not within an edit distance of two of the proper spelling and would not be correctable. This is not too surprising. Names are traditionally hard to spell, there are many alternative spellings for the name ‘Britney’ that are real names, and many people searching for music artists for the first time may have only heard the name pronounced and have never seen it in its written form. A 33% miss rate for a popular artist’s name seems a bit high, so I thought I’d see if I could improve on this. I have one big advantage that Peter didn’t. I work for a music data company so I can be pretty confident that all the search queries that I see are going to be related to music. Restricting the possible vocabulary to just artist names makes things a whole lot easier. The algorithm couldn’t be simpler. Collect the names of the top 100K most popular artists. For each artist name query, find the artist name with the smallest edit distance to the query and return that name as the best candidate match. This algorithm will let us find the closest matching artist even if it is has an edit distance of more than 2 as we see in Peter’s algorithm. When I run this against the 593 Britney Spears misspellings, I only get one mismatch – ‘brandi spears’ is closer to the artist ‘burning spear’ than it is to ‘Britney Spears’. Considering the naive implementation, the algorithm is fairly fast (40 ms per query on my 2.5 year old laptop, in python). With this artist-oriented spelling checker in hand, I decided to take a look at some real artist queries to see what interesting things I could find buried within. I gathered some artist name search queries from the Echo Nest API logs and looked for some interesting patterns (since I’m doing this at home over the weekend, I only looked at the most recent logs which consists of only about 2 million artist name queries). Not surprisingly, very popular artists are the most frequently misspelled. It seems that just about every permutation has been made in an attempt to spell these artists. Which artists are the easiest to spell? Spelling correction for artist names is perhaps the least sexiest job in the music industry, nevertheless it is an important part of helping people connect with the music they are looking for. There is a large body of research around context-sensitive spelling correction that can be used to help solve this problem, but even very simple techniques like those described here can go along way to helping you figure out what someone really wants when they search for ‘Jastan Beebar’.